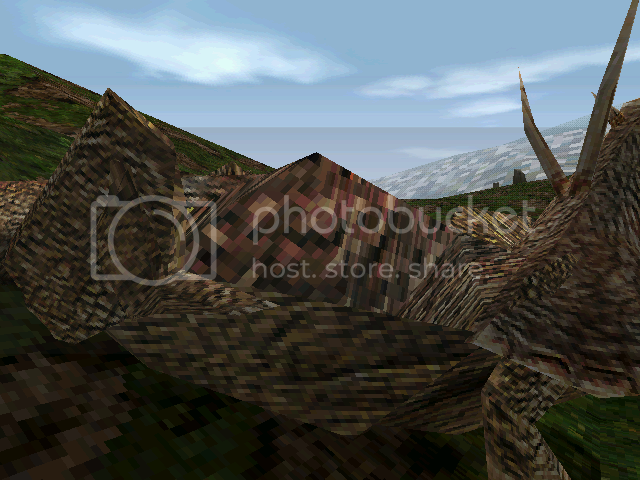 TresCom Forums • View topic - Does this Triceratops look unusually red to anyone else? Post subject: Does this Triceratops look unusually red to anyone else? Post subject: Re: Does this Triceratops look unusually red to anyone else? I took a look and your right, there is something going on with this triceratops. After three retries I managed to get a good look at the reddish mark on his back with a blackish grey outline. During the second attempt there did appear to be some red along the crest but it seems faint, though that might be because of the head stretching. Also here's the red triceratops you mentioned. It's likely a texture bug, the T-Rex in the E3 BUILD 6 has a seriously messed up texture. Or the red markings could have been meant to specify gender but due to issues it was dropped. Hmm. Neat little find, Glitch. Everyone was always hunting for the green rex and brown Raptors, but the unused skin I always thought looked the best was this triceratops. Wish we could find the one in MinePass's screenshot as it looks pretty close to the JP movie trike. Drac - MinePass posted the same image as an attachment in his post. Are your attachments working properly on here? Found this pic while looking for the ACunit1 image. I think this is an exact match to the one we are seeing. And since I was already there I pulled a couple more. This ones reddish color is a close match to the one in my last post. And based on the diminishing red coloring from the early model in my last reply to now, this could indicate a timeline in the development of the triceratops to the bland grey model we see in the retail. You could be right. It may be related to level palletes. Depending upon if it's using an existing pallete, it's color could be different. I just thought it was interesting so I posted it here. I honestly wasn't sure if the textures looked like that internally or not. We all know how finicky the engine is with handling palletes. Also probably should mention that the trike in the final does have some red on it in similar places. However, it's more of a rust red and almost orange in color. Getting off subject: I wonder if the Rex and Para textures were always low res from the beginning and they just looked better in 3DS Max or if they lowered the resolution of the skins to improve the framerate once they realized they were too large ingame. That reddish one would be awesome to see tho! I have notice that about the poly count too. I do believe the green T-Rex share the same poly count as one of the green T-Rexes tho, one of the female ones IIRC. That is a good question. Maybe the one size textures were a test to see if it was possible to make good textures using one file instead of several, so save space etc. It is possible it looked good in 3ds Max with some tweaking, like you say. The Red Trike... We know there were alternate colors/brightness-levels for prototype Tres dinosaurs. Guess they adjusted them as they went.